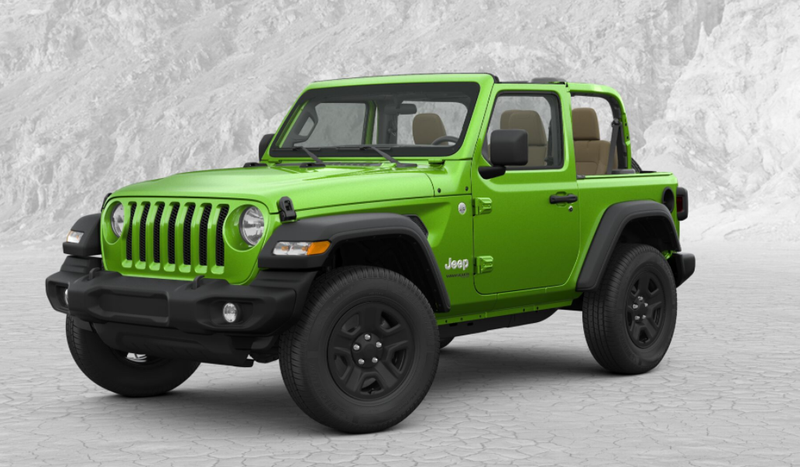 The new Jeep Wrangler JL is better than the already-excellent outgoing model in many ways. So it’s not surprising that I’m drooling all over my keyboard right now as I configure a JL while simultaneously devising a diabolical get-rich-quick scheme. The Jeep in the picture above is pretty much the JL I’d buy. I say “pretty much,” because I’d definitely go for the half doors, but—for whatever reason—the configurator doesn’t seem to let me choose those. The vehicle I’ve digitally built is an awesome “Mojito! Clear-Coat” two-door, manual Sport with tan seats (sadly, there’s no option for a tan dashboard or center console; just the seats), a $595 limited slip differential, the $795 Trailer Tow and HD Electrical group, and $1,295 worth of air conditioning (I’m hesitant to drop that coin on air conditioning, but it does seem like a good call if I’d ever need to resell the vehicle). There doesn’t seem to be a 3.73 axle ratio option, so I’d have to make do with 3.45; good thing the manual transmission’s first gear ratio is markedly shorter than that of the NSG370 transmission in the outgoing JK. I’m thrilled with how reasonably-priced the limited slip differential is, though the AC is quite a tough one to swallow. I also don’t like that I can’t seem to get LED headlights or alloy wheels on the base Sport, but I guess that’s what the higher trim levels are for. The manual, body-on-frame Wrangler with stick axles, a rear limited slip differential, air conditioning, and four cool auxiliary electronics switches to hook up my winch and light bar comes in at $31,000. That’s about $30,000 more than the Jeeps I’m used to buying. And while I’d never spend that kind of money on a new vehicle when there are Golden Eagles out there available for a tiny fraction of the price, I’ll admit I’m at least a little tempted to participate in some legally-sketchy activities to quickly come up with 31 large.